For those who want to make elderberry syrup for babies but don’t want to use honey this recipe is for you. Most elderberry syrup recipes call for honey, but for babies under one honey is contraindicated. 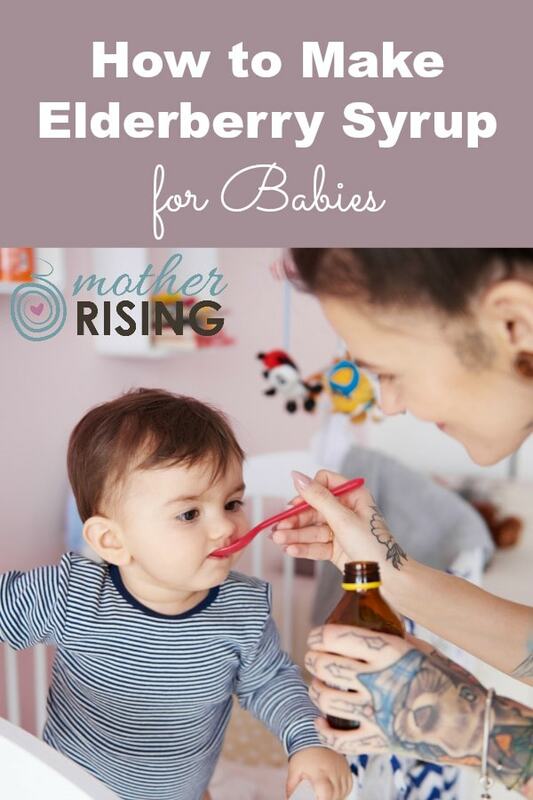 This recipe is a perfect way make elderberry syrup for babies. When babies are sick the best way to keep them healthy is to continue to breastfeed. If you’re not breastfeeding, or if you would simply like to boost their immune system, babies that have already begun dabbling with table food may use elderberries. 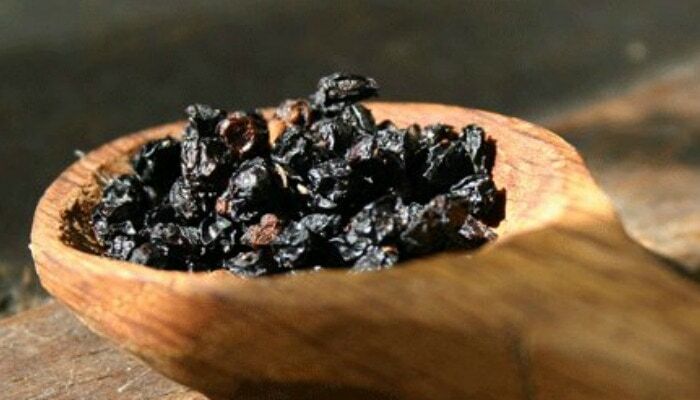 Elderberries are a sweet, tasty and simple way to decrease the severity and duration of cold and flu symptoms. Note: I am not a doctor, or any sort of medical professional. The information in this blog post is coming from my experience as mama and herbal enthusiast. Combine sugar with water in a pot on a stove over medium heat. Stir constantly until you can no longer see the sugar granules. Do not bring to a boil. Store your simple syrup in the refrigerator. Note: Sugar acts as a preservative which is another reason the simple syrup is helpful when making your own elderberry syrup. Pour ingredients in a pot and bring to a boil. Reduce heat and simmer for an hour. While simmering, use a spoon to mash elderberries so that it gets really mixed up. After an hour or when about 1/2 cup of water have evaporated, remove from heat. Strain elderberries and pour elderberry concentrate in a sterilized mason jar. 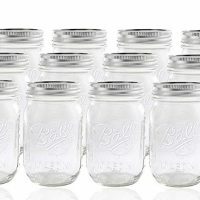 Store in a glass mason jar. NOTE: You can sweeten this recipe to taste. If you prefer, use less or more thick simple syrup to cater to your needs. NOTE: Head on over here for instructions on how to make Instant Pot elderberry syrup. Simply substitute honey with the simple syrup described in this recipe. Babies can take 1/4 – 1/2 tsp of elderberry syrup per day for daily maintenance. During times of cold and flu this can be increased to 2-3 times per day. TIP: Create “elderberry ice cubes” by mixing elderberry syrup and breast milk. Put on a highchair tray for a yummy snack and some sensory play. 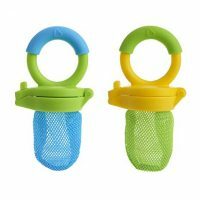 TIP: You could also try a mesh baby feeder for a similar result. 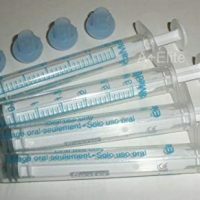 TIP: The easiest thing, I think, is using a small syringe. Mercy thought it was amusing! Most elderberry syrup recipes call for honey, but for babies under one honey is contraindicated. This recipe for elderberry syrup is perfect for babies. To make a simple syrup, combine sugar with water in a pot on a stove over medium heat. Remove from heat and store simple syrup in a glass mason jar. Pour elderberries and water in separate pot and bring to a boil. While simmering, use a spoon to mash elderberries. Strain elderberries and pour elderberry juice in a sterilized mason jar. To finish, combine three parts elderberry juice to one part simple syrup. 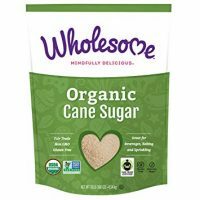 Can you use coconut sugar instead of regular sugar? Sure! You could also use cane syrup. Thank you for this natural flu remedy! I am already seeing improvement in my son’s flu symptoms after giving him the syrup! I just was wondering if this needs refrigerated after it is all made up, or if it should be stored at room temp? Is this alright to use for a 3 month old? I noticed you said something about babies dabbling in table foods, but would it also work for those younger than that. I would like to know this as well! Following…. Can I give my 3week old elderberry without honey? I have used this recipe multiple times and my little one seems to bounce back MUCH faster! I have a batch made up, but I was wondering how long it was good for while refrigerated? To be honest, I’m not sure. I’m guessing a few months. But we always use it up rather quickly! How many ounces of syrup does this recipe make? Unfortunately I don’t know. So sorry! It makes about 16 oz giver or take, depends on how much water you lose while simmering. I saw you recommended the “ Sambucol” formula but wasn’t a fan of it. I use Gaia for myself, but didn’t know if the ingredients in that were bad for little ones. They have a kids one but she is 10 months so I know honey is a no-no. So really is there much difference or something in my formula a baby shouldn’t be having? Organic Black Elderberry, Organic Acerola fruit, Vitamin C (from Organic Acerola), Organic cane sugar, water, lemon juice. I was wondering if this recipe has to be pressure canned to avoid botulism? Do I need to wait till my baby has a full stomach to give this to her? 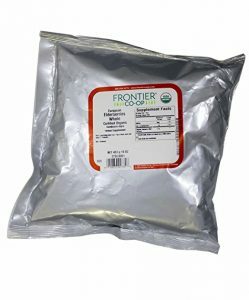 Has anyone ever had their baby (5months) getting diarrhea from elderberry syrup or sambucol? My baby has been drinking it with nothing unusual happening . I was confused too. I just kept adding the syrup to the elderberry solution until​ it taste acceptable for me and for baby. I stored the rest of the syrup in the fridge for another batch. It depends on how sweet you want it ….I guess. The syrup is working beautifully in my baby. Have a beautiful day. I just want to say thank you so much for posting this recipe. 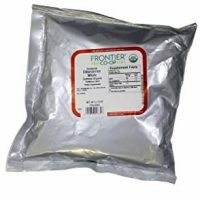 My 11 month old baby got a cold and I have been thinking on elderberries as a great remedy; but don’t want to take the risk with raw honey. So I thought there has to be a way to do it and did some research online and came across this web site. I just gave him 1/2 tsp and will keep giving it to him. I added to my recipe: fresh garlic+fresh ginger+cinnamon+a bit of thyme since my baby doesn’t mind for those flavors at all. God bless you and thank you again. Is this recipe on for a 5 month old?m since there is no honey? How old was your baby when you started giving them this? How Old does a baby need to be to take this? I have an 11 week old and hoping to boost her immune system since we have older kids with friends who have the flu. Hi! Thank you for this! My 11 month old has had a “cold”/ “flu” thing for over a month (along with my other 3 kids…). A few weeks ago she was hospitalized for pneumonia, bronchiolitis, para-influenza and a couple viruses… She’s recovered from that, but has had this wicked cough and lots of muscles for the past two weeks. No fever this time so it’s not a hospital emergency. So I’m so hoping this elderberry syrup will help her kick it! I ended up using dried berries. It’s the end of winter up here in Calgary, Canada so no fresh ones. I assume it’s the same recipe for dried? I did use fewer berries (1/3 c instead of 1/2…). Anyway, thank you for this honey-free recipe! I meant “mucus”, not “muscles”! Is your recipe for dried or fresh berries? Would it be okay not to add sugar? I’d rather not give additional sugar to my baby if I don’t have to. Yes, but you’ll likely need to use something if you want baby to take it a second time ;). Try some agave syrup, or stevia, or something. Also, the sugar or honey thickens the mixture, which is helpful. Let me know what you decided to do and how it went! I’d love to hear your feedback. Can this be used for adults? If so, what would the dose be? Can you use fresh berries? Would it be the same directions/recipe? I would imagine you would need more fresh berries to get things to equal out to the dried berries. Try using double the amount of elderberries if using fresh. Also, you may need to use less water in the recipe too. Hope that helps! Thank you for this recipe! What is the youngest that a baby can be to use this recipe? How long after it’s made can I give to my LO? Once it has cooled it’s good to go! I was wondering if you could use agave nectar instead? Would that preserve it? I am sorry if someone has already asked this. For Daily Maintenance: Adults: Take 2 teaspoons daily, Children: Take 1 teaspoon daily. For Intensive Use: Adults: Take 1 tablespoon four times daily, Children: Take 1 tablespoon two times daily. Would it be ok to give this to a 3 month old? I was thinking of adding 1/2 tsp to his bottle.